A few lucky guests may get to meet Mickey Mouse in a new, interactive way over the next couple of weeks at the Magic Kingdom. Disney will periodically be running tests by having Mickey talk to the guests he meets. 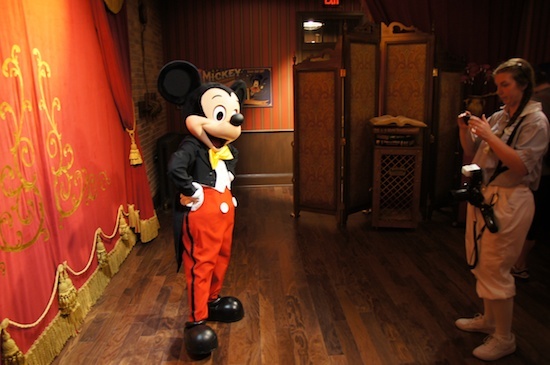 While Mickey has talked to guests before during tests at Disneyland in May 2010 and the D23 Expo a few months ago, this is Mickey’s first time talking to guests at Walt Disney World. Reports say he talked with guests for about 30 minutes during his Not So Scary Halloween Party last night, and that he may be talking to guests periodically for the next week or two in his regular Town Square Theater location. There’s no word on when or if talking Mickey Mouse will permenently start meeting guests at the Magic Kingdom or any of his other greeting spots. In the comments below, let us know what you think about this new way to meet characters. What would you ask Mickey Mouse if you had the chance? I love it….makes it more realistic, and personable….which is what makes Disney so special and memorable…always adding that personal touch that gives you the feeling that u are their number one…. This is great, it’s so much better to be able to talk to Mickey than just get a nod! Okay, sorry, y’all, but that’s just CREEPY. The eyes, the moving mouth, the voice — I’d be creeped the heck out if I saw that at Disney World. If you guys like it, more power to you. Me, I’m just gonna steer clear of creepy Mickey. Besides, it’d be SO much cooler were it Donald.